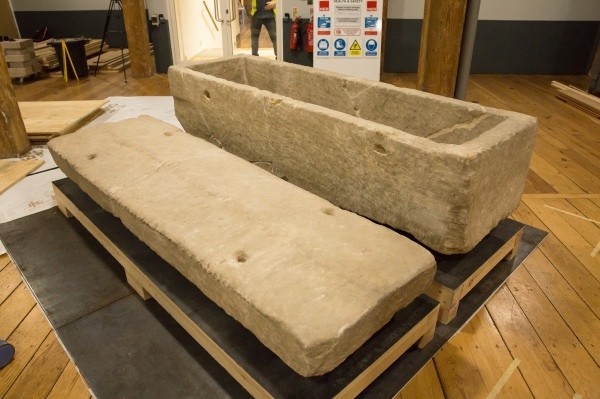 Excavated in a dig in Southwark during the summer of 2017, this Roman sarcophagus is now at the centre of a new exhibition, Roman Dead, at the Museum of London Docklands. 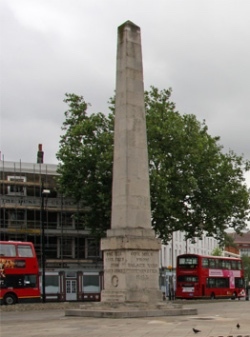 The site of the find, on the corner of Harper Road and Swan Street in Borough, is located in what is known as the ‘Southern Cemetery’, one of a number of distinct burial grounds located on the outskirts of the Roman city of Londinium. 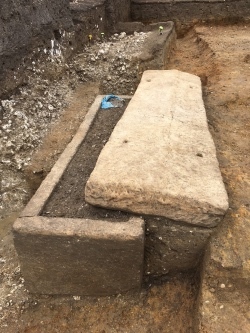 Some 500 Roman burials have been found in the southern site but the stone sarcophagus was the first discovery of its kind there. The 1,600-year-old sarcophagus measures approximately 2.4 metres long, 75cm wide and 65 centimetres high. The lid of the coffin had been partly pushed to one side, indicating that it may have been disturbed by grave robbers during the 18th century. The interior was left partly filled with soil and small bones and a damaged Roman bracelet were found nearby – a possible indication that it was a child buried there. Gillian King, senior planner for archaeology at Southwark Council, told the BBC at the time of the find that the grave owner must have been “very wealthy and have had a lot of social status to be honoured with not just a sarcophagus, but one that was built into the walls of a mausoleum”. The sarcophagus is only the third to be discovered in London – one was discovered at St Martin-in-the-Fields near Trafalgar Square in 2006 and another in Spitalfields in 1999. Roman Dead is running at the Museum of London Docklands until 28th October. Admission is free. For more, see www.museumoflondon.org.uk/museum-london-docklands. PICTURE: Top – The sarcophagus being prepared for display; Side – The sarcophagus as it was found (© Southwark Council). This prison dates from the time of King Richard II (1377-99) and stood off Borough High Street (just to the north of the Church of St George the Martyr) in Southwark until the mid 18th century when it moved to a new premises. The prison, originally based in two houses apparently known as the Crane and the Angel (Angel Place bears witness to the latter), was first used for those convicted at the travelling court of the King’s Bench. The prison was burned several times during periods of unrest and was upgraded during the reign of King Henry VIII. Among those imprisoned here were the reformer and martyr John Bradford who was held here before being burned at the stake in 1555 during the reign of Queen Mary (when it would have been known as the Queen’s Bench). By the 1600s, it had become a debtors’ prison and in the mid-17th century – during the Commonwealth it was known as the ‘Upper Bench’ – it reportedly held around 400 inmates who carried a collective debt of £900,000. As with other prisons, the comfort of prisoners depended very much on their financial circumstances – those with money were able to live quite well. Those imprisoned here during this period included the dramatist Thomas Dekker and the King of Corsica, imprisoned in 1752 for debt (he died only four years later). A Parliamentary inquiry in the 1750s revealed a host of problems with the prison including overcrowding, the practice of extortion by prison officers, promiscuity and drunkenness among prisoners and other irregularities, all of which led, in 1758, to the prison being closed (and later demolished) and moving to a new premises in St George’s Fields, Southwark (we’ll deal more with that facility in an upcoming post). PICTURE: St George the Martyr on Borough High Street near where the first King’s Bench stood. 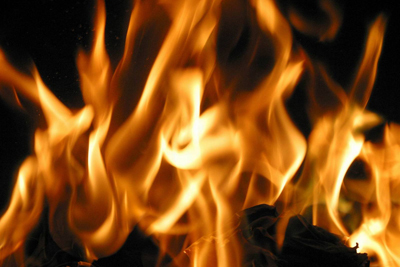 Of course, the Great Fire of London in 1666 is only one of numerous fires which have occurred in London (although it was no doubt the greatest in terms of destruction). But among others was a fire in 1212 which has been described as London’s worst in terms of the death toll which some have put as high as 3,000 (although it’s generally believed it’s unlikely to have been that high). 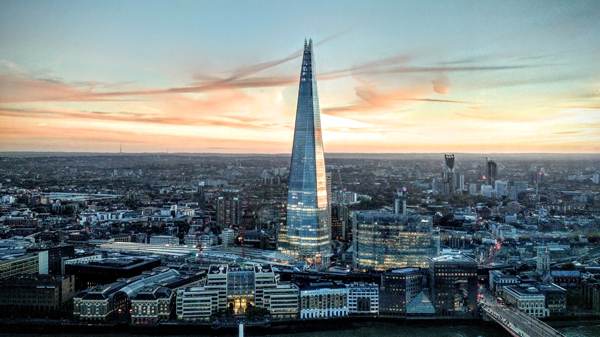 The fire, which only came some 77 years after another great conflagration destroyed a stretch of the city reaching from Westminster to St Paul’s Cathedral in 1135, began in Southwark on 10th July (hence it’s also known as the Great Fire of Southwark). 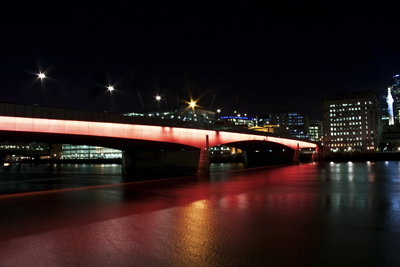 Crossing London Bridge, it went on to destroy a large part of the City itself. 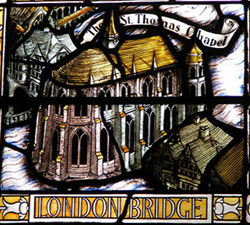 As well as destroying buildings on London Bridge including houses and the chapel (the structure itself, having recently been rebuilt in stone, survived somewhat intact although it only remained in partial use for some time afterward), also destroyed the Southwark church known as St Mary Overie (precursor to today’s Southwark Cathedral) as well as many buildings around Borough High Street. 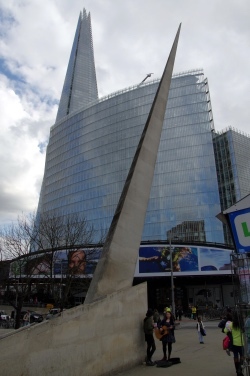 There were apparently numerous deaths – the story goes that many of them occurred when a mass of people poured onto London Bridge from the City as they attempted to cross to Southwark to help put out the fire (or perhaps just gawk at it). They were trapped in the middle of the bridge when, with the south end was already ablaze, the north end caught fire from sparks. As well as suffering fatally from the effects of flames and smoke, people were apparently crushed in panic and others were pushed off the bridge to drown in the River Thames (along with some of the boat crews who tried to rescue them). And, just as the Great Fire of 1666, the fire of 1212 did result in some building reforms including the placement of a ban on the use of thatch for rooves. 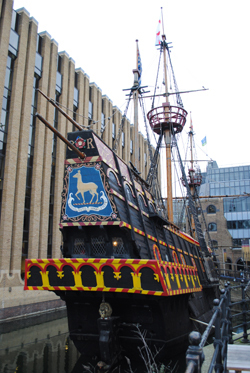 Launched in 1973, this full-sized, working replica of the galleon sailed by Elizabethan seafarer and courtier Sir Francis Drake on his circumnavigation of the globe between 1577 and 1580 is moored at St Mary Overie Dock in Bankside. The ship was made at the behest of two American businessmen, Albert Elledge and Art Blum, who wished to commemorate the 400th anniversary of Sir Francis Drake’s landing on the west coast of North America in 1579. The ship was designed by Loring Christian Norgaard, a Californian naval architect, who spent three years researching it, drawing on original journals of the crew members and other manuscripts. The two year job of building the vessel was given to J Hinks & Son who did so in Appledore, North Devon, using traditional methods and tools (with a few modern concessions). The ship was officially launched from the Hinks shipyard by the Countess of Devon on 5th April, 1973. She sailed out of Plymouth on her maiden voyage in late 1974 and arrived in San Francisco the following May to commemorate Sir Francis’ proclamation of New Albion at a site believed to have been in northern California in 1579. Since then, the ship has sailed more than 140,000 miles around the world – like its forebear, it has circumnavigated the world – and been feared in various films including Shogun (1979), Drake’s Venture (1980) and St Trinian’s 2: The Legend of Fritton’s Gold (2009). 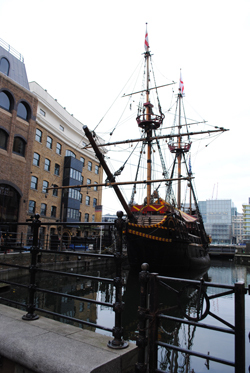 It has been moored in Southwark since 1996 – it did leave briefly for a visit to Southampton in 2003 – and as well as hosting school visits, is also open for tours and can be booked for private functions. WHERE: Golden Hinde II, Bankside (nearest Tube station is London Bridge); WHEN: Self-guided tours 10am to 5.30pm daily (check website for other tour times and dates); COST: Various (depending on tour); WEBSITE: www.goldenhinde.com. 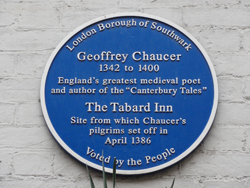 Famed for its mention in Geoffrey Chaucer’s iconic 14th century work, The Canterbury Tales, The Tabard Inn once stood on Borough High Street in Southwark. 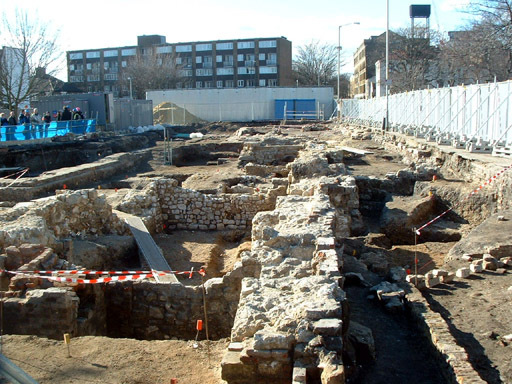 The inn was apparently first built for the Abbot of Hyde in 1307 as a place where he and his brethren could stay when they came to London and stood on what had been the main Roman thoroughfare between London and Canterbury. It became a popular hostelry for pilgrims making their way from the Chapel of St Thomas á Becket on London Bridge to the saint’s shrine in Canterbury Cathedral and was one of a number of inns which eventually came to be built in Southwark at the London end of the pilgrim route. It’s in this context that it earns a mention in Chaucer’s 14th century work as the pilgrims set off on their journey. The inn passed into private hands following the Dissolution and in 1676, 1o years after the Great Fire of London, burned down in a fire which devastated much of Southwark (the back part of it had been damaged by fire a few years earlier). Earlier patrons may have, it’s been suggested, included the Bard himself, William Shakespeare. It was subsequently rebuilt as a galleried coaching inn and came to be renamed The Talbot (it’s been suggested this was due to a spelling mistake by the signwriter). Its neighbour, the George Inn, still stands in Talbot Yard (it was also apparently burnt down and rebuilt after the 1676 fire). Business for the coaching inns dropped away, however, with the coming of the railways and the building was converted into stores before eventually being demolished in 1874. A plaque to the inn can be seen in Talbot Yard (named for the inn’s later incarnation) – it was unveiled by Terry Jones in 2003. Do you have a favourite? Or maybe there’s a ‘small, secret and historic’ garden we didn’t mention that you love (and we may mention in a future special)? 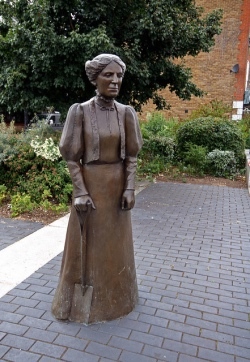 We travel south of the Thames this week to Red Cross Garden in Southwark. 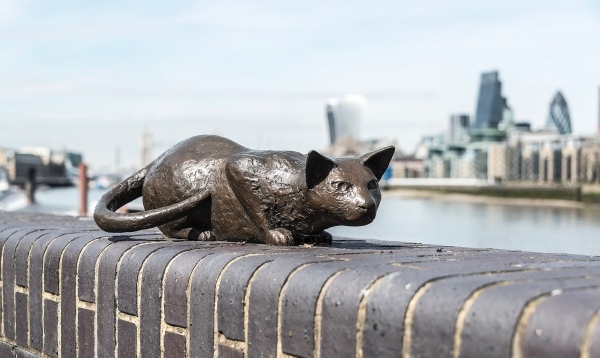 Located not far from Borough Market, the garden has a rich history, having first been laid out in 1887 by the social reformer, philanthropist and National Trust co-founder Octavia Hill. Described as Hill’s “flagship project”, it was here, after being granted use of the land by the Ecclesiastical Commission, that she demonstrated the role gardens and open spaces play in improving the lives of the poor living in 19th century Southwark (in the picture you can see in the background the hall and cottages which were also part of the project – Hill had these constructed between 1888-89, the hall being for community activities and the cottages homes for the “working poor”. Both were designed by Elijah Hoole). The garden in Redcross Way was created on the site of a derelict paper factory and a hop warehouse and originally contained meandering paths, an ornamental pond with fountain, a bandstand and a covered play area for children as well as an elevated walkway for viewing the garden – described by Hill as an “open air sitting room for the tired inhabitants of Southwark”. There were a number of colourful mosaics – one called The Sower is still in situ but another known as The Good Shepherd was apparently lost. 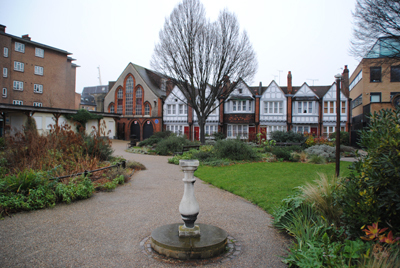 The original layout of garden, which were used as the venue for the annual Southwark Flower Show as well as other events, had been lost by the late 1940s and it was only in much more recent years that it was restored by the Bankside Open Spaces Trust (with funding from the Heritage Lottery Fund and Southwark Council). 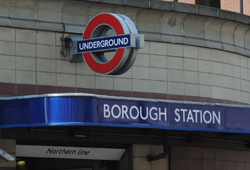 They were officially reopened in 2006 by Princess Anne. The award-winning garden is now managed by BOST which leases the space from Southwark Council and relies on the work of volunteers (any donations are always welcome!). The latest addition has been the Victorian bandstand which, constructed in a style true to the original, was unveiled late last year. WHERE: Red Cross Garden, Redcross Way, Southwark (nearest Tube stations are Borough and London Bridge); WHEN: 9am to dusk, daily; COST: Free; WEBSITE: www.bost.org.uk/open-places/red-cross-garden/.